Folks in Florida are probably already planning their NCAA basketball victory celebrations -- but the fat lady hasn't sung yet and there are a couple of teams that could still take the title. The Florida Gators have been a favorite of bookmakers and bettors since March Madness betting began a couple of weeks ago. Intertops Sportsbook oddsmakers expect Florida to win on Saturday and for the Gators to ultimately get past their three worthy opponents to take the Championship title on Monday. 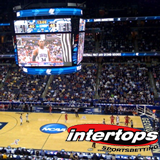 Intertops Sportsbook favors the Florida Gators (+110) to win the NCAA Championship on Monday over Kentucky (+250), Wisconsin (+275) and Connecticut (+800). However, Florida still has to beat the UConn Huskies (shouldn't be a problem) and then the winner of Saturday's other Final Four game. “For Connecticut coming in as a decided underdog, having already played Florida and beaten them should give them not only some confidence but also some idea of how to play the Gators,” said Sports Illustrated’s Seth Davis. Intertops Sportsbook has posted odds on both Final Four games this weekend and on who will win the Championship on Monday, April 7th. Intertops will also be taking live wagers during the games that begin at 6:05 pm and 8:45 pm ET Saturday. And by the way... Matt B. from Illinois will be enjoying the 2014 Final Four Weekend live at courtside after winning Intertops’ Final Four Tickets Contest. Every dollar wagered on the 2014 NCAAB Men’s Division 1 Championship is a chance to win a trip to the 2015 Final Four Weekend.